Recent projections on seniors living longer are certainly borne out at The Birches communities. Just last week members of the Residents Club for The Birches at Chambers and Chambers Court met to fete William McDonough on the occasion of his 100th birthday. Bill was born November 23, 1911, and he considers himself “just an ordinary guy.” Bill didn’t know why people would make such a fuss. So he was surprised at the turnout that included residents, owners Steve and Judy Aaron, and staff of Birchez Associates and Rondout Properties. Or that we would want to interview him. 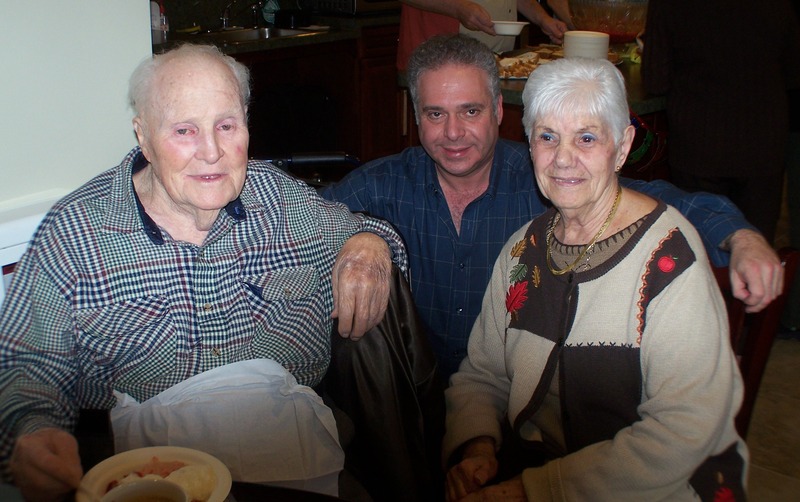 Earlier this year, Bill was honored as a centenarian by the Ulster County Office for the Aging. 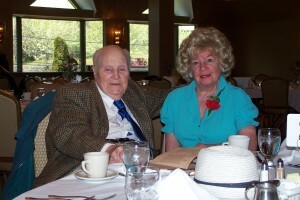 On the left, pictured before the luncheon began at the Hillside Manor, is Bill with his loyal helper Dorothea Schwenk, a resident of Chambers Court since 2004. Since the County’s celebration, it’s been about six months of birthday acknowledgments. 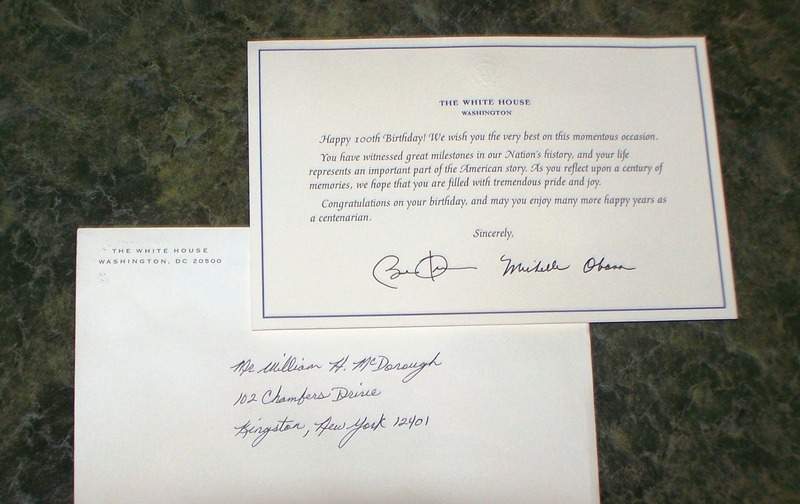 He brought one to the party this week, a birthday card from the President and First Lady (click on the photo so you can read it!). This was in addition to the number of declarations and proclamations from many local politicians and dignitaries including State Senator John Bonacic, Assemblymember Kevin Cahill, and Ulster County Executive Mike Hein. Bill lived in the area for 25 years before moving to Chambers Court early in 2008. He values living in a safe senior community. Bill says he’s found a really nice place and values the new friends he’s made. Bill is, at the moment, the only centenarian living at one of the Birches Communities but there are a number of residents close behind. Currently there are 43 residents aged 85 and over, with 14 of those 90 or over. 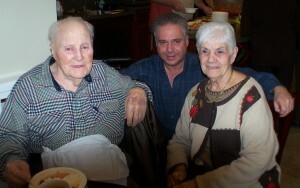 In the picture to the right taken at the Residents’ celebration, Bill is pictured with Tess Glassman, a Birches at Chambers resident who turned 90 on November 20th. Between them is Steve Aaron, founder and managing member of Birchez Associates which developed and manages four senior communities in Ulster County.